Garrett Oliver wins at James Beard Awards; a first for beer. The news was announced Monday night. For the first time ever, beer had won at the James Beard Awards. At the gala celebration in Manhattan, Monday evening, 5 May 2014, Garrett Oliver —long-time brewmaster at Brooklyn Brewing Company, author of several books including the award-winning The Brewmaster's Table (a tome on beer and food), and the editor of the comprehensive Oxford Companion to Beer— received the prestigious award for Outstanding Wine, Beer, or Spirits Professional, the first time a beer professional has been recognized by the James Beard Foundation. The mission Of the James Beard Foundation is to celebrate, nurture, and honor America's diverse culinary heritage through programs that educate and inspire. The James Beard Foundation Awards are annual awards for excellence in cuisine, culinary writing, and culinary education in the United States. The Awards were established in 1990 and are held annually on the first weekend in May. Okay, so I know that posting about something you've won is a class-A dork move, but hopefully you'll allow me this one. 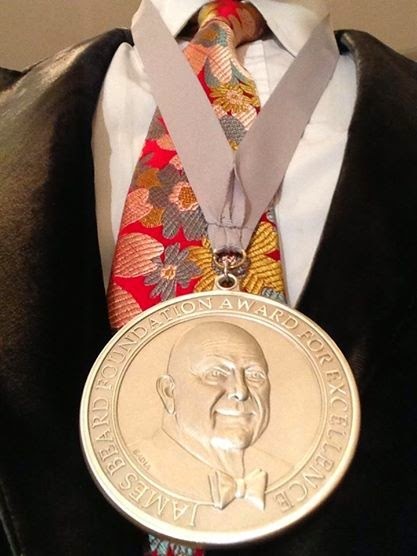 Last night I was named "Outstanding Wine, Beer, or Spirits Professional" by the James Beard Foundation. These awards are often called "the Oscars of the food world" and given the star-studded black tie ceremony at Lincoln Center, the description seems apt. What Oliver wrote next really demonstrates why the man deserved the award, and why it was a milestone moment for good beer in the United States. I don't need to tell you that beer has always taken a back seat in these circles, though by rights beer should have arrived here a very long time ago. My esteemed fellow nominees, especially Sam Calagione and my friend David Wondrich, have preached our bona fides from the rooftops for many years. This shiny chunk of bling is for my Brooklyn Brewery brewing team and for all the 3,000 American breweries making some of the most amazing beverages the world has ever seen. Stand facing the mash tun, get stuck in, and make some magic today. "This thing of ours" is the very best thing in the world. 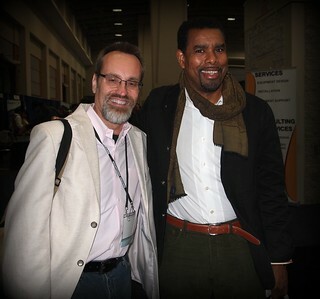 and I, at the Craft Brewers Conference in Washington, D.C., in 2013. 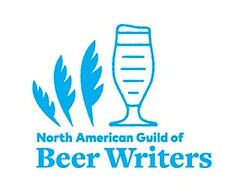 Not that beer's worth and beauty needed outside affirmation, but Mr. Oliver's award was, in a way, recognition by the sometimes myopic wine and food world for the accomplishments of all of American 'craft' beer. So, congratulations, Garrett Oliver. 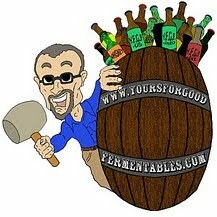 And, thank you for all you've done for the cause of good beer (and good food) as brewer, author, and advocate.